A ten day culinary and yoga workshop to feed your mind, body and soul. This yogi lifestyle workshop is a marriage of Indian vegetarian science and Hatha Yoga practices designed to equip you with the tools to live a healthy, stress free life. We begin by analyzing your body type and, through taste and exploration, understand the ancient culinary philosophies. We then immerse ourselves in all aspects of Rajasthani cooking, from the curation of vegetarian menus, the role of provenance and the joys of community dining. This workshop will teach you how to reconnect your body and mind with nature and engage your senses like never before. Learn the foundation of Ayurvedic food science and begin understand the profound effect food can have on the body. Each person will take a dosha test to identify their body type and will be equipped with the fundamentals of how to and what to eat to live a healthy and nutritious life. A series of lectures on holistic approaches to eating and how to enjoy a balanced vegetarian diet. The lectures will focus on the three main food groups; fats, carbohydrates and proteins with simple practices on how to maintain a healthy and exciting diet filled with a variety of tastes and smells. Female and male technicians deliver detox and healing therapy sessions using local ingredients such as sesame oil, herbs and rice. Your unique prescription will determine which course of therapy is correct for you. For a complete list of services see our A La Carte menu. Vigorous Ashtanga in the morning, and relaxing Hatha in the evening. Our teachers join us from around the world. You’ll learn to perform postures accurately and safely, and return to your home with a fixed, healthy routine. No matter if you are a beginner, or experienced, we will make sure you are correctly and patiently educated to advance your own balance. We look forward to practicing with you. Yoga Therapy is a perfect companion to Ayurveda, and even allopathic medicines. You will meet with a certified therapist who will prescribe specific asana (postures to practice daily) to cure or manage ailments such as back pain, headaches, gastro intestinal disorders, snoring, and many other annoying modifications our bodies make without permission. You will also meet with Yogeshwar Surajnath Siddh to discuss the spiritual implications of your illness, and suggested activities to eliminate it. For more information, read through our Yoga Therapy page. 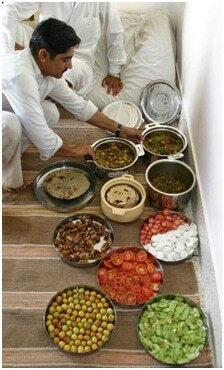 Learn the delights of Rajasthani cooking; the rituals, tastes, textures and smells. You will join our chef in the kitchen to learn the science behind spice, grain, dairy and vegetable combinations to satisfy your particular Dosha, in keeping with a clean, vegetarian lifestyle in support of ultimate wellness and an excellent yoga practice. 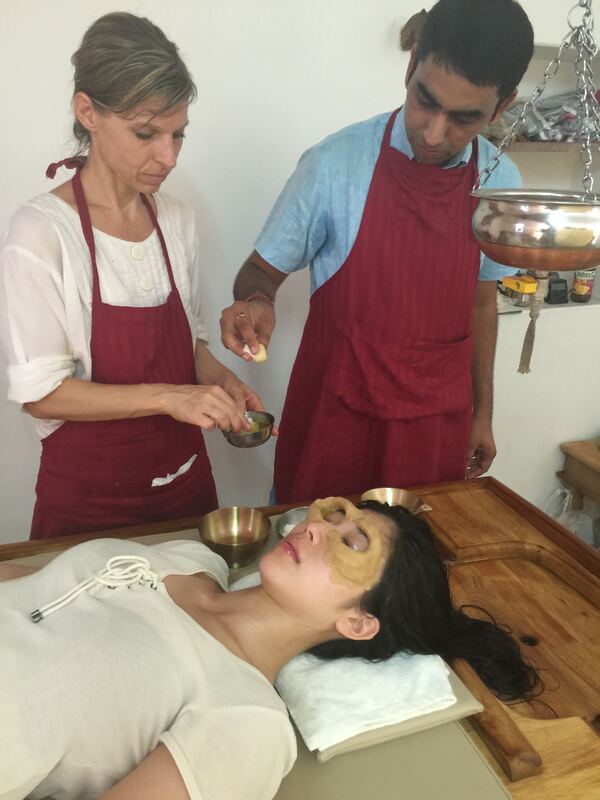 We will also pair your dosha to a natural tea in our tea tasting session. A take home tea pack and suggested ingredient substitutes will be provided to ensure all dishes and teas can be created away from the ashram. You’ll also take home a beautiful and inspiring cookbook with all the recipes and instructions. Within our ashram garden we proudly grow bountiful amounts of fresh organic produce that feeds the kitchen and all the ashram inhabitants. Here you will be given a tour of the interesting vegetables and fruit grown local to the region and an understanding the importance of ecology and respect for nature. Additionally you will learn how to grow a range of herbs and vegetables at home which are intrinsic to ayurvedic medicine. Enjoy a night sleeping under the stars at our eco retreat; a 35 acre oasis filled with fruit trees and a natural swimming pool. Prepare dishes using wild plants in the traditional Rajasthani open fire style, pick pomegranate’s fresh from the trees and trek through nearby forests and up hills. Rampura is pure natural escapism. Read more at ECO RETREAT. Get involved in a traditional fire dancing ceremony. Help prepare local Rajasthani dishes that will be served to hundreds of people and enjoy the magnificent fire dance performance. 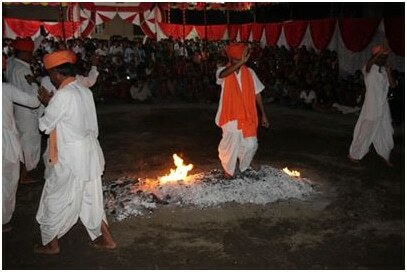 Our fire dancers follow the 9th century yogi Jasnath’s teachings, which allow them to transcend their bodies, and walk barefoot on flames while chanting a 5-note raga together with the beating drums. The 2-3 hour ceremony leaves participants and the audience blissful and amazed at the strength and ability that faith gives all humans. 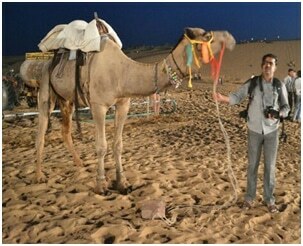 This is a great opportunity to understand the unique culinary and cultural rituals of Rajasthan. At sunset you will drive into the sand dunes and witness endangered species of deer and bird, and the trees that bare the fruits, nuts and grains integral to survival in the desert. See the lifestyle of indigenous peoples who have made this arid region their comfortable home for many generations. One of the oldest forts in India, Nagaur Fort is a majestic fortress housing ancient methods of cooking, irrigation, water heating and cooling. You will be guided through the fortress and its dining rooms, learning of its amazing history, followed by some city shopping in the trade district. 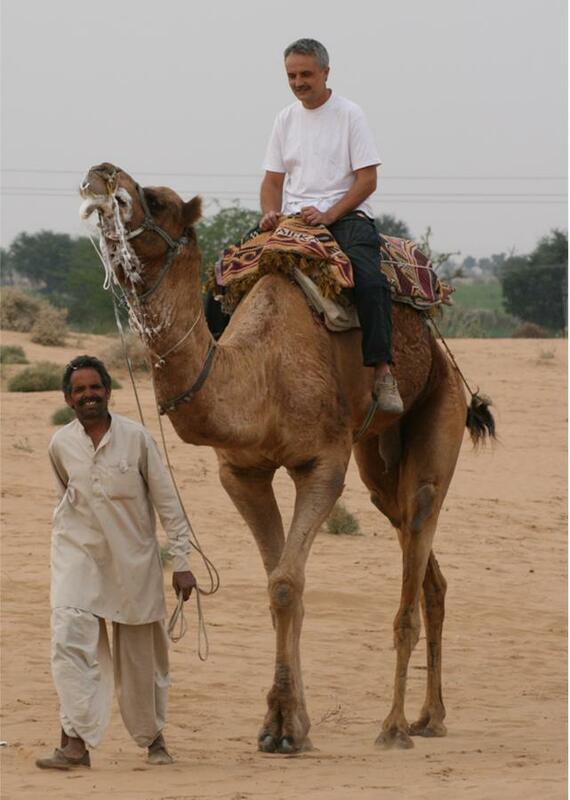 Ride out into the sunset atop a camel chosen for you by talented trekking guides. Return to camp for a moonlit meal and dance. Sleep in tents, swooned by the breeze across the dunes. Family and guests gather in the main temple at sundown where previous guru’s are interred in living graves. We sing, play instruments and sometimes dance as a way of worshiping, showing gratitude and respect for the accomplishments of these gurus, and our continuing connection to them, and the dividends of their lives in this place. It is a sweet way to end the day. After puja we sit under the stars and listen to stories or spiritual philosophies as the guru presents topics relevant to the day. Sometimes it’s a Q&A session, or a mantra practice session. It’s casual, and usually guided by the audience. Read more at PUJA. 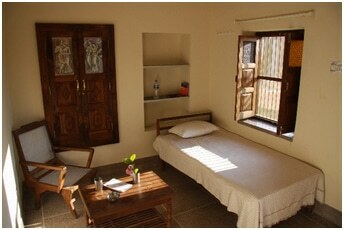 Each retreat accommodates only 12 people to ensure an intimate and quiet retreat. There are a variety of room styles to choose from, ranging from basic to luxurious. Read more at Your Stay at SJA. A light breakfast, lunch and dinner be served daily based on your doshas. Some of these will be made by you and some by our lovely ashram kitchen. Our famous aromatic chai will be served every morning and afternoon for you to enjoy. Learn a little bit about the ashram family who will be caring for you during your stay on the Our Team page. 1) Find 11 friends and book all 12 seats at once to receive a 7% discount on the total. 2) Put your name on a waiting list with us and we will book all the seats ourselves. We’ll contact you when it’s time to secure your spot.